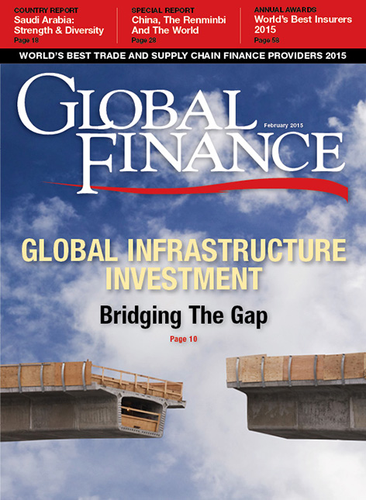 In January, Global Finance sat down with Arvind Rajan, International Chief Investment Officer at Prudential Fixed Income, to discuss the impact of low oil prices on the ability of emerging markets to service their debt. Global Finance: Where do you see oil prices going? Arvind Rajan: Over the next 12 months, there can be a huge swing in both directions. Our working assumption is a downside and upside scenario of $35 to $75 per barrel. But they will not go back to what they used to be. GF: What’s driving them down? Rajan: There is a tug of war between low-cost and high-cost producers. There was a game change in tactics that is probably a very major factor in the drop in oil prices. The [goal] is to force higher cost producers out of the market. While they are being forced out of business, as long as they are operating, they actually have an incentive to pump. Countries that are somewhat uncompetitive with respect to the oil price—let’s say, Russia or Venezuela—have an incentive to try to make up for it as much as possible with volume rather than shutting down. GF: What’s your medium- to long-term scenario for Russia? Rajan: Russian corporates have a tremendous cushion. Now it’s true that they have about $100 billion [in debt] coming due next year, but they also have about $75 billion in cash. So they are not as much in the hole as you might think. There will be a queue to get preferential financing from the Russian government, because they are cut off, really, from the financial markets. The combination of sanctions and low oil prices is going to put a lot of financing pressure on them. Rajan: They will not be allowed to default. Putin’s ambitions for Russia are to make it a real global player. He is not interested in being a defaulted debtor, and he doesn’t need to do that. So I think some individual names in Russia will be at risk for refinancing, but not the major names. They [Russian policymakers] want to bring the world around to their point of view. You don’t do that by defaulting. It would have to be a willingness issue—not an ability issue, given about $400 billion in reserves—[for the government] to shut off a major company from paying its debt. To turn around on the people who have financed you, whose financing you need in order to grow the economy over the next few decades, would require a different mind-set than the one that you might adopt in your geopolitical strategy. GF: What’s your outlook for Venezuela? Rajan: Venezuela is in a world of pain. They will need to devalue. They will have to become more efficient. And they will need to make extremely difficult and painful fiscal policy decisions, none of which are feasible. They just have a balance sheet that doesn’t work. GF: How likely is it that Venezuela will default on debt this year? Rajan: It’s a high probability, which is already more than reflected in Venezuelan bond prices. Venezuelan bonds are trading at recovery levels if not lower because we don’t know, of course, exactly what a restructuring would entail. I think the market is discounting a 100% probability of default, which is probably a little too high, for the next 12 months. There is actually a lot of value in Venezuelan bonds.